Universal Credit (UC) is a benefit that is paid to working age people on low income with low / no savings. It is paid whether they are in or out of work, a carer, sick and/or disabled, look after children or need support with housing costs like rent or mortgage. UC will be extended to all new claimants of means tested benefits from 13 December 2017. UC will replace Income Support, Income- Based Jobseekers Allowance, Income- Related Employment and Support Allowance, Housing Benefit, Working Tax Credit and Child Tax Credit. It will not replace the other benefits like contributory Jobseekers Allowance or contributory Employment and Support Allowance. You may need to claim UC if you have a change in your circumstances that ends your current entitlement to benefits. How is Universal Credit different from other benefits? There will be no paper claim forms. Most claims will be made online. No benefit entitlement for the first seven days at the start of your claim – known as ‘waiting days’. Entitlement to benefit starts from the 8th day of your claim. You then enter an assessment period for one calendar month. After this your entitlement to benefit will be assessed and paid (6 weeks from date of claim). the start of the assessment period. You must tell DWP straight away within the same assessment period for any increase. • Any decrease in entitlement will be backdated to the start of the assessment period that the change occurred in. • Awards will be paid to one member of a couple. • You will receive one monthly payment that includes an element for your rent. You will have to pay your rent to your landlord. • You can ask about alternative payment arrangements. • All claimants, including both members of a couple, will be placed in a work related conditionality group. • Your claim will be managed online and communications will be via email / text. • Claimants will have to complete an online journal to maintain their claim. You will need to have a bank / building society account, post office or credit union account to receive your payments. Some banks provide free accounts. What do I need to claim UC? 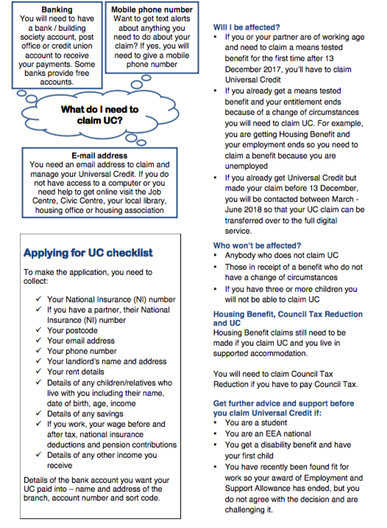 If you already get Universal Credit but made your claim before 13 December, you will be contacted between March - June 2018 so that your UC claim can be transferred over to the full digital service. 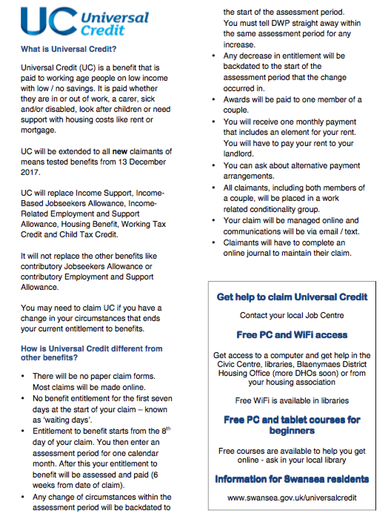 Housing Benefit claims still need to be made if you claim UC and you live in supported accommodation. You will need to claim Council Tax Reduction if you have to pay Council Tax. work so your award of Employment and Support Allowance has ended, but you do not agree with the decision and are challenging it. Details of the bank account you want your UC paid into – name and address of the branch, account number and sort code.